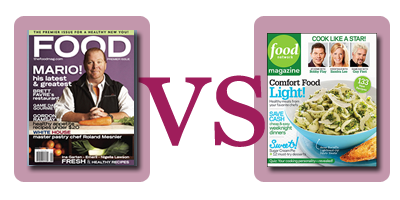 Food Magazine vs Food Network Magazine: Which One Deserves Your Money? I usually don’t do this. In all my years reviewing products from electronics to hand cream I haven’t put two products up against each other, but since I plunked down cash for two food magazines over the past week I figured I’d give you my take on each and let you know which one you should spend money on. Food magazine (www.thefoodmag.com) is brand-new on the magazine scene. In fact, their February/ March 2009 issue is their premier issue and in a lot of ways it shows. While the attractive cover with Mario Batali looked promising (that’s why I grabbed it off the shelf) I was disappointed with the inside design. Each article’s title is designed with a different typeface, color, and design, which made the magazine feel cluttered, disjointed, and messy. A little uniformity will go a long way in the forthcoming issues. Although some of the articles were interesting they lacked real depth and I even found a few glaring editorial mistakes. The Good News: The team behind Food effectively got their glossy on newsstands nationwide in one of the most bleak economic times the country has ever seen. That says a lot for their tenacity and how they’ve been able to sell their vision to advertisers and distributors. Now, all they have to do is tighten their design and add more interesting articles and they’ll be a major player in the food magazine industry. While Food Network magazine (www.foodnetwork.com) isn’t new, it’s definitely new to me. I was really impressed by how interesting each and every editorial page of the magazine is. The sleek, stylish design coupled with the mouth-watering recipes, tantalizing photos, and well-written and well-researched articles make for a superior magazine. It’s one of those magazines that you can read over and over again and find something new each time you flip through. It’s a definite must-have! The Bad News: Food Network magazine is published by Hearst and while it’s terrific, their next issue isn’t coming out until May! Ridiculous. 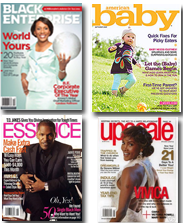 Either you publish a magazine regularly or you don’t; no skipping months allowed! Idiocy that the Food TV Magazine is MIA until May. My last issue was Feb/March. Love Food TV, but what the hell is that???? ?